Comments: Males are iridescent black while females and juveniles have a brown chest and neck. Anhingas are most likely to be confused with cormorants. However, Anhingas’ bills are dagger-like and do not have a hooked end. They swim with only the neck and head above water and spear fish with their bills. In flight, the long tail is fanned open. They are often seen with their wings outstretched to dry and warm themselves in the sun. 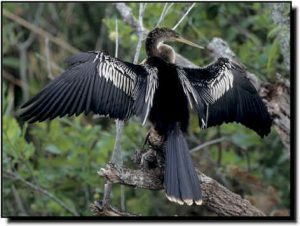 Anhingas occur in small numbers or are found only in localized sites within the Great Plains.